Great for a summer time dinner party. Heat oven at 200c/fan 180c/gas 6. Use a small sharp knife to make a slit along the side of each chicken breast to form a pocket. 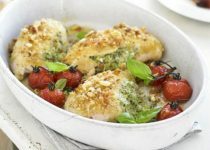 Mix together the pesto and mascarpone, then carefully spoon a quarter mixture into each chicken breast and smooth over the opening to seal. Brush a little oil, about 1tsp, all over each chicken breast and season well. Tip the breadcrumbs and the Garlic Italian seasoning onto a large plate and season. 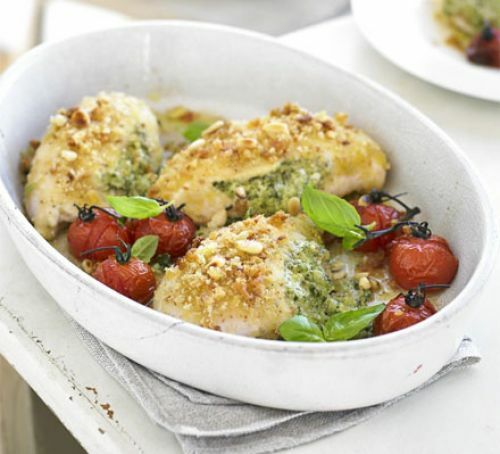 Place each breast on the plate and press all over with the breadcrumbs. Place in a lightly oiled shallow baking dish along with the tomatoes (keep together on the vine in a couple of bunches). Drizzle over the remaining oil. Cook in the oven for 20-25 mins until the chicken starts to turn golden and is cooked through. Scatter over the pine nuts and cook 2 mins more. Sprinkle with sautéed Garlic Scapes.